Philadelphia is first on the list to test and review Panera's newest menu item — the double bread bowl — which will come to locations in the city starting Sunday, Aug. 5. 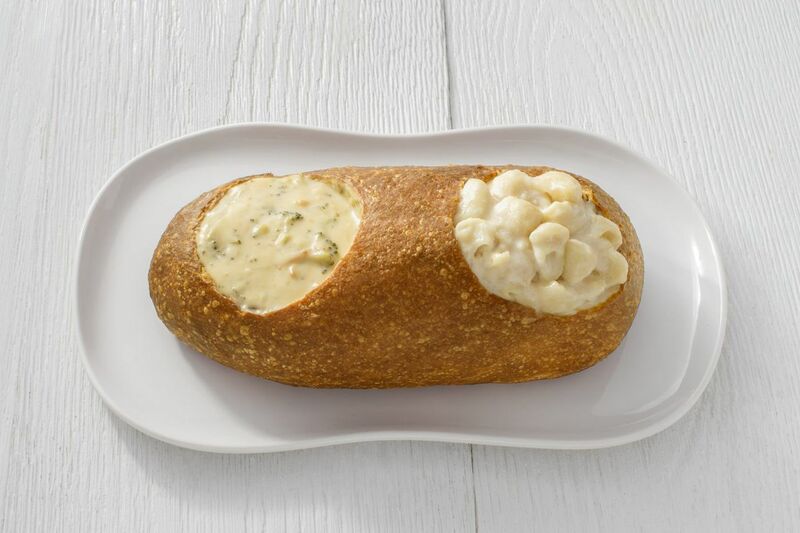 The double bread bowl features two holes carved into one loaf of bread (the shape of which looks curiously similar to a double-duty dog feeder), which can be filled with any Panera soup or mac & cheese combo. The purpose? The soup and salad shop is marketing its newest concoction as a meal for sharing — in other words, although it's double the size, it may only be half the fun. Panera recommends splitting the loaf "with your BFF, significant other, or even a coworker." However, as you will literally be eating from the same trough, be sure that the person with whom you choose to share is someone you feel, well, close to. And maybe cut it in two before gnawing through the bread bowl itself. You don't want to lock lips with that aforementioned coworker mid bite of broccoli cheddar soup — or, maybe you do? Of course, there's no rule saying you can't eat the whole thing yourself, either. Those with ravenous appetites or who are prone to indecisiveness can chow through the whole thing. The double bread bowl will be available upon request at Philadelphia Paneras from Sunday, Aug. 5, to Friday, Aug. 31, with a potential nationwide launch in the future.